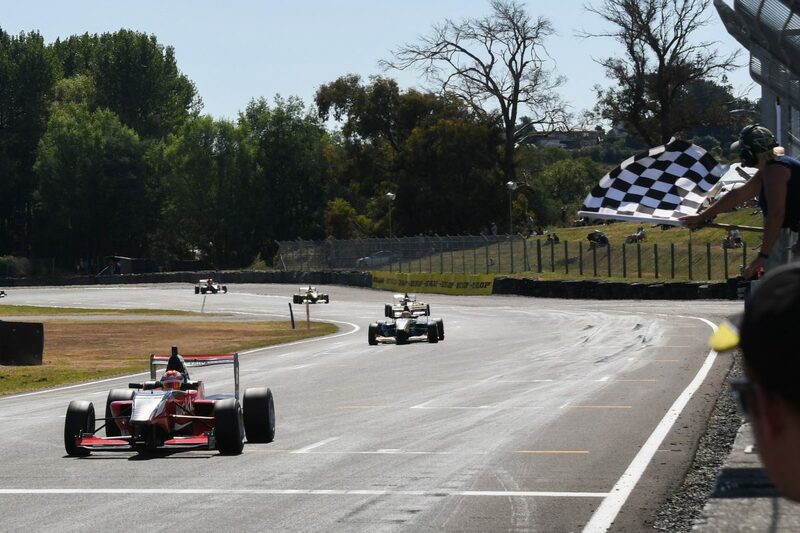 Marcus Armstrong trails Castrol Toyota Racing Series leader Liam Lawson by just a point after beating him to victory in Race 1 of the title decider at Manfeild. Armstrong gradually crept away and managed a mid-race Safety Car restart well to clinch a vital win and set up a tense finish to the series tomorrow. Lawson had qualified fastest but it was Armstrong that got the jump and the pole man instead had to fight off Lucas Auer to end the opening lap in second position. Armstrong was almost 1.5s up on M2 Competition team-mate Lawson at the halfway mark of the 20-lapper before a Safety Car came when Kazuto Kotaka (Japanese) spin and took out Petr Ptacek (Czech) on Lap 11. The restart came on Lap 15 and Armstrong negotiated it beautifully, going on to win by 1.1s. Behind Lawson, Austrian Auer was a lonely third, one spot ahead of New Zealander Brendon Leitch. “We’re back in game,” declared Armstrong. “To be honest, there was a little bit of a question mark over our qualifying speed and what happened. “Liam is doing a really good job, I have to give him that but I don’t give up and it’s going to go down to the very end I’m sure. Calan Williams headed the Australian contingent in fifth, with countrymen Jackson Walls 10th and Thomas Smith 14th. The oldest driver in the field by several decades, the legendary Kenny Smith, finished 13th. There are two more races remaining this season to decide which of the Kiwis, Lawson or Armstrong, will win the 2019 Castrol Toyota Racing Series. The first of those is a 15-lap sprint with the top eight from Race 1 reversed on the grid, while the 64th New Zealand Grand Prix will be contested over 35 laps in the afternoon.